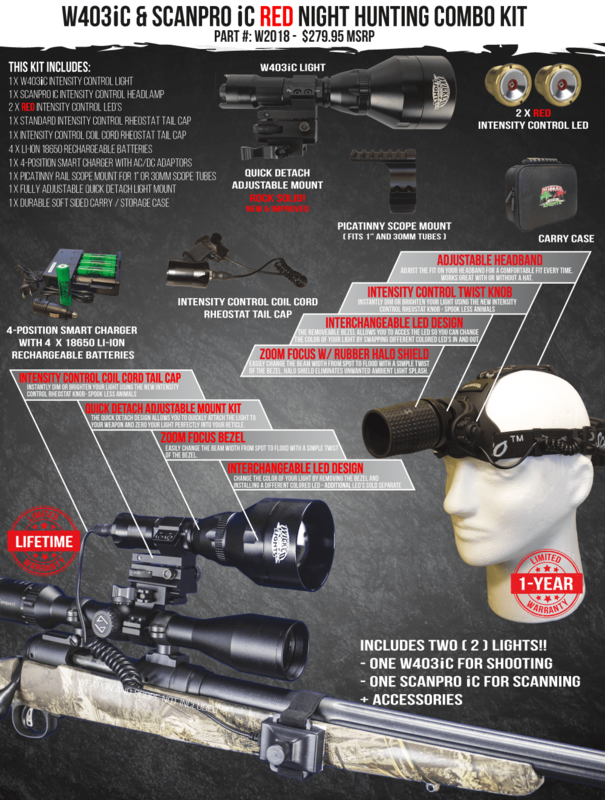 Wicked Hunting Lights™ is excited to announce the addition of the all new W403IC &ScanPro IC Night Hunting Combo Pack. This kit includes one of our award winning W403IC Night Hunting Lights with full Intensity Control and Scan & Kill® Technology and one of our ScanPro IC Night Hunting Headlamps with full Intensity Control. That's right, both of these models feature full Intensity Control, making their Intensity Control LED's completely interchangeable between the W403IC and ScanPro IC. Well, the full intensity control gives the hunter the ability to use less light. Less light = less animals spooked. The intensity control knobs on both the W403IC and ScanPro IC are designed to allow the hunter to set the intensity of the light BEFORE the light is turned on. This allows a hunter to condition the animal to the light by starting on a low power setting and gradually increasing the brightness of the light or headlamp until they have just enough light. Animals tend not to notice the subtle or gradual increase in brightness as much as suddenly being blasted by a bright beam of light. Also, in many situations the light does not need to be on full power to be able to identify the animal. The Intensity Control rheostat knobs allow the hunter to increase the brightness until they have just enough light to make positive identification. This technique completely eliminates the worry of putting too much light on the animal because the hunter can stop increasing the brightness of the light at any time. By using the Intensity Control feature to start on low, then conditioning the animal with a gradual increase in brightness, and stopping when there is just enough light; the hunter will spook less animals, period! The W403IC is purpose designed & built specifically for night hunting, modeled after our proven and extremely durable W402ZF model. The W403IC is not just adapted for use as with virtually all of the competitor lights. In fact a large percentage of "night hunting light companies" are using the exact same light known as a model number HS-802, or clone of it, and just having their name lasered onto the side of it. 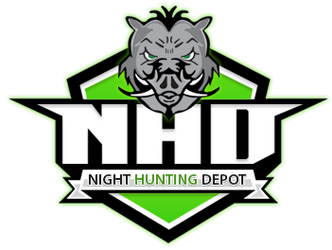 That's it, that's the extent of their research, development, field testing, design, prototyping, and effort in the development of their brand of night hunting night. In reality the HS-802 is an adequate utility flashlight, but it doesn’t hold a candle to a Wicked Hunting Lights W403IC. For more detailed info on the W403IC, see our "W403IC Basic Design Features" section below. We have Paired the W403IC with our ScanPro IC Night Hunting Headlamp With Full Intensity Contol and Scan & Kill Technology. The new ScanPro IC out shines the competition PERIOD! Unlike virtually all headlamps used for night hunting which are simply re-branded utility style headlamps, the Wicked Lights ScanPro IC Headlamp was purpose designed and built for night hunting. When we say "Night Hunting" were talking a headlamp specifically featured and designed to be used for scanning and locating hogs or predators or their eye reflection while they are responding to a call. Many expert night hunters appreciate the advantages of using a quality headlamp for "scanning for eyes" as it eliminates both the fatiguing act of repetitious hand scanning and the often cumbersome transitions from hand held light to shouldering of the firearm. With the ScanPro headlamp's ability to adjust the beam diameter to "flood" to cover a wide area, head movement is and fatigue are minimized, and the transition to shouldering a weapons is seamless. See our "ScanPro IC Basic Design Features" section of this page for more detailed information on the ScanPro IC Night Hunting Headlamp. The easy, hands free, scanning with the ScanPro IC, paired with the extreme long range W403IC mounted to a weapon gives the hunter the ability not only to scan and shoot at the same time, but to spook less animals! This scan and shoot combo, along with the full intensity control, zoom focus bezels, and interchangeable LED's make this combo pack an ideal setup for any night hunter. Successfully target hogs, coyotes, fox, bobcat, raccoon and varmints at night with the Wicked Hunting Lights™ W403IC & ScanPro IC Night Hunting Light and Headlamp Combo Kit. Our third generation hunting light with Scan & Kill® Technology. Featuring a unique Zoom / Focus design which allows you to focus and or defuse the light beam. The W403IC comes with the Red Intensity Control LED. The LED assembly features a 3-year warranty. RED LED - Ideal for general predator hunting (coyote, fox, bobcat, etc) and light shy animals. Uses the same high power Intensity Control LED as the W403IC and A48IC lights, allowing you to swap LED's between all three models. **Approx battery life using high quality, fully charged, Wicked Lights 18650 3.7 Li-Ion 2900ma battery. Note: Battery quality varies widely between brands and ma ratings are often grossly exaggerated on cheap batteries. During our testing we noted the Wicked Lights 18650 2900ma batteries would last up to 2 times longer then many private label brands. Green, Red, and White Led may begin to dim after long periods of continuous operation (as battery discharges).